Robert Philip Eaton, MD, beams with contagious enthusiasm as he strolls through the bustling hallways of UNM Hospital. Phil Eaton is emeritus vice president for the UNM Health Sciences Center. His leadership and vision helped elevate the institution to the forefront of cutting-edge medicine. Now he is being recognized with a Living Legend award bestowed by the UNM School of Medicine. In his many decades as a physician, clinical scientist and administrator, Eaton touched the lives of many patients and left a lasting impact on the health sciences community. 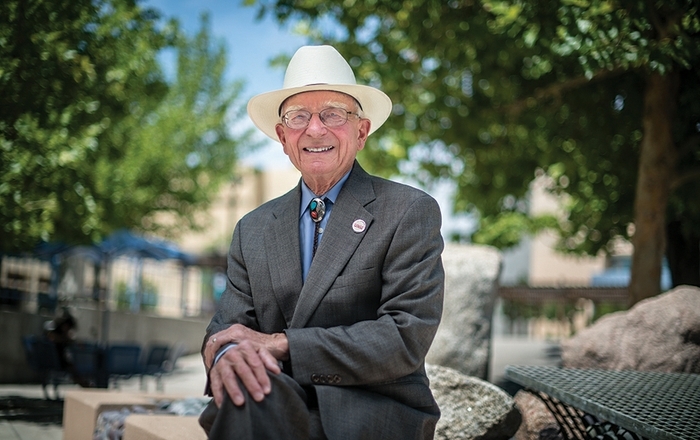 “I focused on moving us to directions where we could use the creativity of research, teaching and patient care to make an impact on the people of New Mexico,” explains Eaton, whose career at UNM began in the late 1960s when he became an assistant professor in the School of Medicine. R. Philip Eaton: Living Legend from UNM Health Sciences Center on Vimeo. Profoundly influenced by his father’s career, Eaton had no doubt in his mind that medicine was also his calling. Eaton prepared himself for a dual role as a doctor and a scientist. “A physician took care of patients and discovered the path of physiology of disease,” says Eaton, who acquired his medical education and training at the University of Chicago School of Medicine, Barnes-Jewish Hospital at Washington University in St. Louis and the National Institutes of Health. Eaton, an endocrinologist, came to UNM as an assistant professor in 1968, focusing on both the causes of diseases and enhanced diagnosis and treatment of patients. Eaton had family ties in New Mexico and saw a unique opportunity at UNM to establish a clinical research center. “I had the chance to have my own laboratory and start a program that did not exist in one of the most beautiful states I had ever seen,” he says. Dean Leonard Napolitano asked Eaton to seek a National Institutes of Health grant to create a General Clinical Research Center, which opened in 1975. The research hub supported Eaton’s work in diabetes, as well as the research of other scientists. He knew that managing diabetic patients was a challenge because no reliable technique existed to accurately measure sugar directly in blood and administer the appropriate quantity of insulin. But Eaton knew how to track the hormone in blood. “I could measure insulin,” he says. In the early 1980s he collaborated with William Spencer, the former director of systems development at Sandia National Laboratories, to develop the world’s first implantable insulin pump for diabetics. “It was the size of a package of cigarettes,” Eaton explains. “It had a little tube and a surgeon could implant it under the muscles of the belly.” The pump was electronically controlled and programmed to deliver specific amounts of insulin. The implantable pump freed diabetics from having to administer daily insulin injections. “We succeeded in delivering insulin quantitatively to an insulin-dependent diabetic person,” Eaton says. Eaton envisioned bringing the institution’s level of expertise to a higher level. “I wanted to take our purebred race horse scientists and cut them loose so they could be even more effective, and leverage their expertise through collaborations,” he says. 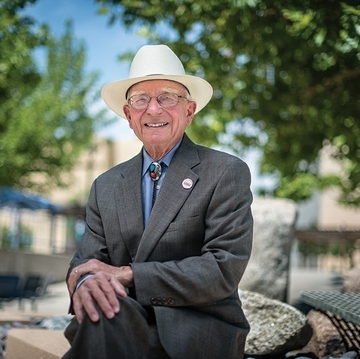 Retaining the scientists within the UNM health sciences family was crucial to Eaton’s vision. “I can’t let them go because someone else has a modern laboratory or better access to patient population,” Eaton says. Eaton, with the help of UNM’s health sciences community, initiated and developed a strategic plan with a 20-year vision. 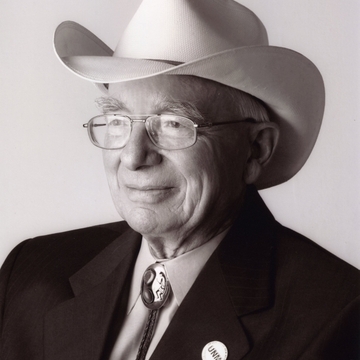 He wanted New Mexicans to have access to the best in health, education and discovery that science can provide. The plan helped to establish modern and flexible research, education and patient care facilities, including a state-of-the-art hospital and the UNM Cancer Center. “It is the people here who made all this happen,” he says. Eaton described watching his vision for the health sciences turn into a “magical experience” with growing visibility, collaborations with start-up companies, technology transfer and economic development opportunities. “It is a massive train with a huge flywheel,” he says. “As it began to roll, it became clear to me it was very difficult for it not to keep rolling. In his emeritus role Eaton remains actively connected to the institution at various levels. He established the Phil and Olga Eaton Garden of Healing for the UNM HSC community and the public. It’s a place where people can enjoy art and pause to reflect on the difference everyone is making in the world. 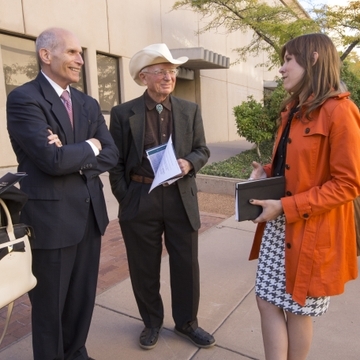 Many people across campus continue to seek Eaton’s advice and guidance. As a mentor and coach he is motivated by helping people discover opportunities. “I want people to be as excited about who they can be, what they can do and how they can help as I am helping others,” Eaton says.